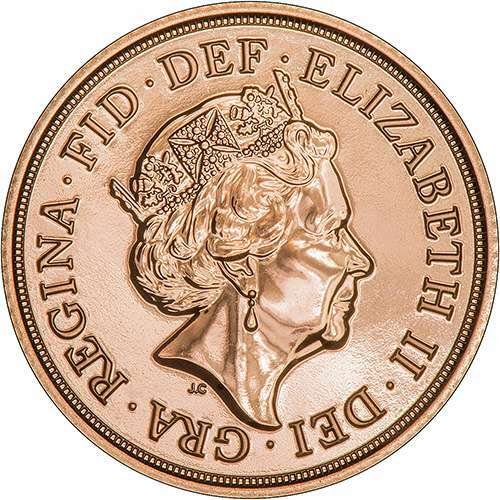 The obverse is the main side of the coin on which the head usually appears. It is commonly called the "head" side, and vulgarly called the "front" side. The opposite side is known as the reverse or tail side. We will attempt to describe and picture the obverses of all the different sovereigns. 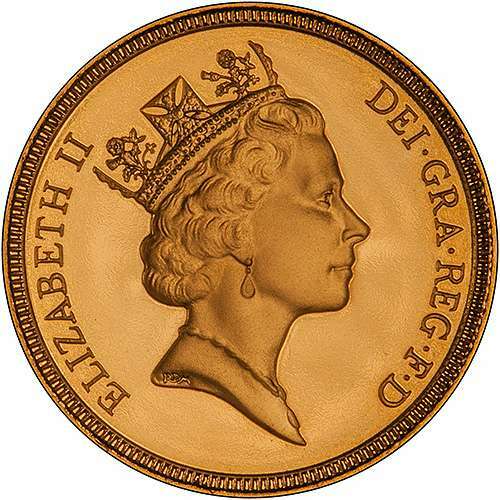 The gold sovereign coin derives its name from the majestic portrait of the monarch or sovereign on the very first sovereigns, which were issued for Henry VII. Our picture shows a sovereign of Elizabeth I, until we can find a Henry VII coin to replace it. Sovereigns were then struck for Henry VIII from 1509. Under Edward VI, his first sovereigns were only in 22 carat gold. From 1550 to 1553, "fine" sovereigns were once again issued with a value of thirty shillings, and also a "standard" sovereign at twenty shillings. 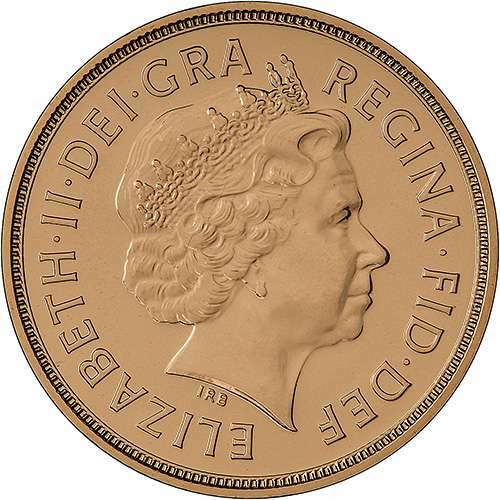 During the long reign of Elizabeth II, "fine" gold sovereigns, with a very high (99.4%) gold content, continued to be issued with a value of thirty shillings. We have shown a triple unite or 60 shilling piece of 1643. We were tempted to show it without the king's head in an attempt to add some humour to the subject, but decided against it. The gold broad of Oliver Cromwell was a twenty shilling coin, and so was the equivalent of a sovereign, however as Cromwell had temporarily removed the sovereign king of England, these coins also had to be renamed. The modern sovereign was introduced in 1817 as part of a major recoinage under George III. Benedetto Pistrucci engraved the new portrait of King George, as well as the famous St. George & Dragon reverse which is still used on gold sovereigns even today. There were two different portraits used on gold sovereigns of George IV. We show here the laureate head used from 1821 to 1825. A bare head was used from 1825 to 1830. A bare head was used on sovereigns of George IV from 1825 to 1830. William IV reigned from 1830 to 1837, and William IV sovereigns were issued from 1831 to 1837 except for 1834. There were two slightly different obverse designs, both featured the bare head of William facing right, the most noticeable difference being in the shape of the ear, and the positioning relative to the lettering. The first portrait for Queen Victoria was the "Young Head", which was used on sovereigns from 1838 to 1887 inclusive. It was refined and modified a number of times during this period. We intend to feature all the different varieties in good time. Here we show the first date of the first type 1838, which has the date below the bust. In 1871, a major modification was made, and a "Type 2" young head sovereign was introduced. The most obvious difference was the change of reverse from a shield to Pistrucci's famous Saint George & Dragon reverse. The main difference on the obverse was the removal of the date, which was relocated to the reverse side. When mint-marks were introduced for the branch mints, the mint-mark was placed under the head, as on our photograph of an 1884 Sydney mint sovereign. This type was issued until 1887 inclusive. The second major portrait of Queen Victoria used gold sovereigns was the "Jubilee Head", which was introduced in 1887, and continued until 1893 inclusive. The third and final portrait used on the gold sovereigns of Queen Victoria was the "Old Head", also known as the veiled or widow head. It was used from 1893 to 1901 inclusive. The first portrait of George V was used from 1911 to 1928 inclusive. It could also be called the "Large Head". In 1929, the portrait on George V sovereigns was changed to the second or "Small Head" type. This was only used on the four dates issued from 1929 to 1932. We show larger images of these two different obverses on our George V Obverses page. The only sovereigns issued for George VI were in the Proof or Specimen sets issued for his Coronation year of 1937. Sovereigns were reintroduced in 1957 using the First Portrait, although the same portrait had also been used for other denominations in 1953 with different wording. This first type was issued until 1968. The coins of 1957 have a finer grained milled edge.The Italians call these "Fiocchi" referring to the ribbons in the Queen's hair. The Second or Decimal Portrait was introduced from 1968 on the 10 and 5 new pence coins, but not on sovereigns of that date. Second portrait sovereigns were issued in most years from 1974 to 1984. The Third Portrait was used from 1985 to 1997 inclusive, except 1989. No ordinary bullion circulation type sovereigns were issued in this period, so that only proof versions are available with this portrait. In 1989, a special portrait was used on the gold sovereigns, and also the other gold sovereign multiples and fractions of that year. This was to commemorate the 500th anniversary of the issue of the first gold sovereign in 1489 for Henry VII. It shows Her Majesty facing, seated and enthroned, in a reproduction of the style used 500 years previously. A Fourth, more mature portrait was introduced in 1998. A Fifth portrait was introduced in 2015. We naturally hope it will continue in use for many years to come. Click here for more information about Queen Elizabeth II Portraits.